When: Friday, January 15, 2010 at 7:05 p.m. The Penguins and the Senators last met on December 30 at Wachovia Arena at Casey Plaza. Chris Lee started off the scoring 1:12 into the game and Penguins captain Wyatt Smith had his second three point night in two games as the Penguins doubled up the Senators 6-3. Former Penguins hero Andy Chiodo started for Binghamton, but was pulled during the Pens’ first period onslaught. It has been a busy week for the Penguins organization in terms of player movement. Before anaylzing this matchup any further, let’s look at which players have joined and left the lineup between Saturday’s loss to Manchester and today. Ryan Bayda (knee injury) is on track to make his return to the lineup. Wade Brookbank (concussion symptoms) is skating with no problems. Jesse Boulerice is also having an easier time skating since hurting his back; however, his status for the weekend is unknown. The Penguins travel to Binghamton to start a three-in-three; all of which will be played on the road. After Saturday’s loss, they remain in third in the East Division with a record of 20-17-1-1. They are four points behind second place Albany. The Penguins should look to produce substantial offense against the Senators, who are second in the division in goals scored with 119. However, Binghamton also has 116 goals scored against them for second worst in the division. Brad Theissen is likely to get the start tomorrow night. He is coming to WBS after being named ECHL goalie of the week. Since December 18th, his ECHL record is 5-0 with a 2.0 GAA and .933 save percentage. Ryan Bayda, in spite of being injured since a game against Hershey in mid-November, remains fifth on the team in goals scored with eight. Look to see if he holds the same scoring touch he boasted prior to his injury; when his goal total was among the highest on the team. Binghamton is looking to bounce back from a two game losing streak last weekend; falling to Lowell at home by a score of 3-2 and getting thumped by Rochester in a 6-1 road loss. Currently the Senators have a record of 16-17-3-1 for fifth place in the East Division. Like the Penguins, the Senators have had a lot of player movement lately. Goaltender Mike Brodeur and Olympian forward Kaspars Daugavins were called up to Ottawa. Martin St. Pierre has been sent down. 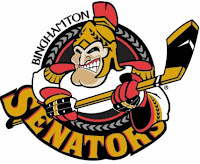 On the staffing front, Ottawa goaltending coach Eli Wilson was relieved of his duties, which no doubt has had an impact on Binghamton as Wilson was just working with the B-Sens goalies last week. Andy Chiodo sustained a groin injury while playing with Elmira of the ECHL and is now in Binghamton working on rehabilitating his injury. Martin St. Pierre is always a dangerous offensive weapon. The 2010 Canadian AHL All Star currently leads Binghamton with 14 goals and 21 assists on the season. Denis Hamel is fifth in the AHL with 17 goals scored and that total is good enough to lead the Senators in goal socring. He is also two points behind St. Pierre in total points as his 16 assists give him 33 points.